Join us for a fantastic value golf break at the Montado Hotel & Golf, a new course for Solos Holidays. 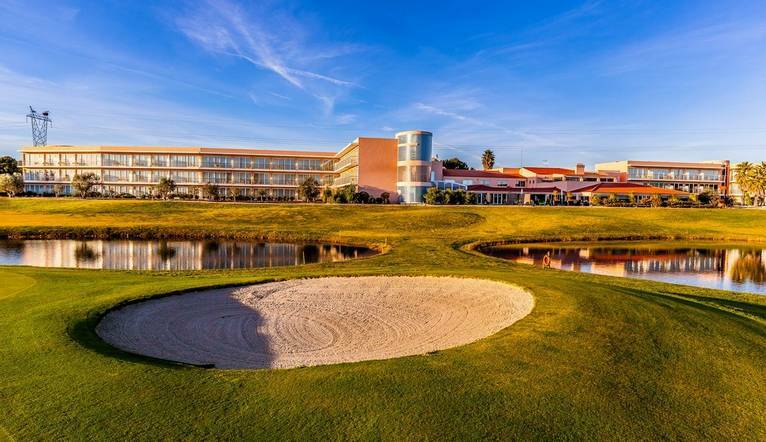 Located in Palmela, just 30 minutes from Lisbon, this hotel is surrounded by beautiful vineyards and is an up and coming golf hotel in Portugal. We’re sure that this is to become a Solos favourite! Come and join us on the sunny Costa Azul for a relaxed week of social, mixed golf. We will be staying at the Montado Hotel & Golf. This hotel has an intimate, friendly feel and is situated right on Montado Golf Course, designed by Tomás Tavira, where we will be playing our 5 rounds of golf. Our social team competitions which are based on Stableford scoring. Our hotel is perfectly located amongst the verdant vineyards and is ideally situated to explore the region’s top golf courses (there are 8 within 30 minutes’ drive) and of course sample the areas wonderful wine! If we fancy some nightlife the vibrant city of Lisbon is just a 30 minute drive away, or for something more laidback the village of Setubal is just 10 minutes away. After complete renovation in 2006, this up and coming course, designed by Tomás Tavira, presents itself as one of the most beautiful and competitive golf courses in Portugal. Set in a landscape dominated by vineyards, the oak trees, streams and lakes make this course unique. The layout of the course offers large greens and holes with interesting characteristics and is renowned for its 18th hole where the green is situated on an island! Located just 30 minutes from Lisbon the Montado Hotel & Golf Resort is perfectly situated in the Costa Azul region of Portugal, near the Castle of Palmela and it is surrounded by vineyards used to make the famous wines of the region. Facilities include a restaurant, bar and snack bar. Plus the brand new clubhouse boasts a gym, sauna, indoor pool and Turkish baths. Many of the rooms offer fantastic views of the golf course and offer a terrace/balcony, hair dryer, mini bar (extra charge) and tea or coffee making facilities. Wi-Fi is available at the hotel. The transfer time from Lisbon Airport to the hotel is approximately 1 hour, depending on weather and traffic.